I've been planning to read The Troop for some time but when I got my hands on an ARC for The Acolyte, I thought I might as well start with that one instead. And if I could only say one thing about it, it would be that it's certainly not something you read everyday. Jonah is an Acolyte, member of a special religion police force that puts the Dystopian into this Dystopian society. As he fails to protect a very important person at a bombing Muslim terrorists are the first suspects. But the evidence might point in a completely different way, and besides Jonah has bigger problems. He's lost his faith. One thing that's certainly creepy about this kind of dystopian stories is that it doesn't feel like something that could never really happen in one way or another. (As opposed to let's say a zombie apocalypse). 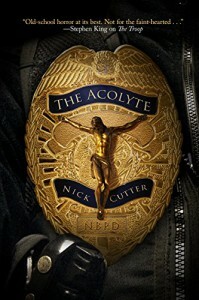 The Acolyte started really good and I thought it was going to be a very good read, perhaps even more than 4 stars, but the second half was very weird. Don't get me wrong, I like weird as much (perhaps a bit more) as the next person when it comes to books and movies but not everything made sense to me, even after I considered that there were religion fanatics and terrorists in play. I never understood exactly why the Quints needed to be added to the story. Near the end there's a gruesome scene that makes me conclude this review with a warning that it's not for people with a weak stomach.